If you want to get more power into your golf swing, you must release the club head hard and fast through impact. To help you do that, in this article I’m going to give you two great drills that will help you to train your body to release the club through impact. The first drill that I’m going to give you today can be done while you’re sitting down. So to do this release drill, find a place where you can sit down and swing a club (preferably your driver) safely and fully on a horizontal plane. Once you’re set then hold out your driver straight in front of you, and then swing it like a baseball player. Hold the club with your normal golf grip however. Now when doing this release drill, don’t just swing once and stop, but rather keep swinging back and forth without stopping. Do this about 50 times. Naturally, because you’re sitting down, you won’t be able to use your legs – which is exactly as it should be. By doing this drill it is forcing you to just swing with your arms and hands so you release the club through impact. 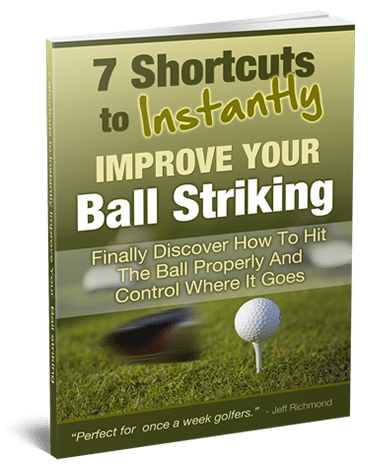 Once you have got used to this feeling, you can move onto an advanced version of the same drill that allows you to hit golf balls. 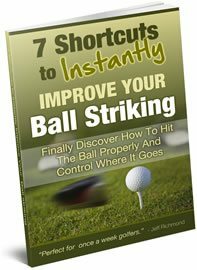 To do this next golf drill simply tee up a golf ball quite high. Then get out your 7-iron and setup to the ball BUT when you setup to the golf ball place your feet together. From this feet together setup position, I then want you to swing back about half way and then swing through to about the same position in your follow-through. By hitting balls with your feet together and with the ball teed quite high up, it will force you to swing with your arms and hands only making sure you release them through impact. These two golf drills are great to help you train yourself to release the club through impact. When you get this you’ll hit your shots much longer with much less effort. So the little effort you put into these golf drills will be paid back many times over.